Marstair Low Temperature Cooling System CXE 70 – CKC 80 is suitable for controlling to low temperatures in larger areas up to 99 square metres depended on indoor evaporator and outdoor condenser unit location. Temperatures typically can be set between 4 °c and 12 °c offering a wide range of uses such as food preparation areas or fresh flower storage. Simple control is offered via the easy to use digital controller. 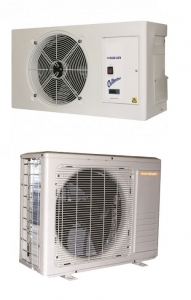 Full information on these Marstair systems can be found in the downloadable leaflet below.